In 1903 Alliott Verdon-Roe started to build a man-carrying version of his successful model, in the hope of winning £2,500 offered by the management of Brooklands to the first aviator who flew round the track before the end of 1907. It was soon clear that the little 9 h.p. J.A.P. engine of his biplane was powerful enough only for taxying, so he hired a 24 h.p. Antoinette. On June 8th, 1908, the new engine enabled him to claim later that he had made the first aeroplane flight by an Englishman in England. Roe's achieve-ments were too late to win the £2,500. 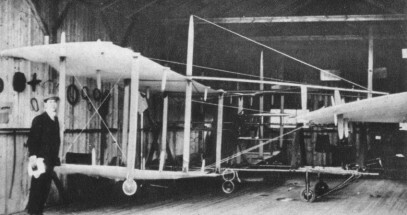 When claims for the distinction of making the first British-powered aeroplane flight were considered officially by the Royal Aero Club 21 years later, it was decided that his early efforts were only hops and not proper sustained flights; the committee accepted the claim of Moore-Brabazon who, in May, 1909, flew a distance of 500 yards in his Voisin.